Shane Sutherland, centre, is set to return. Anderson is due to return to Pittodrie after today’s League 2 match against Cowdenbeath, which he will miss with an ankle injury which has kept him out since the 7-0 defeat against Peterhead on January 2. The 19-year-old has made a strong impression at Borough Briggs, netting seven goals in 14 appearances, however Price is preparing for life without the striker. He said: “It looks like we are probably going to lose Bruce, although we are not sure what’s going to happen with him yet. “He will certainly be going back to Aberdeen in the short-term, and then a decision will be made on him towards the end of the month. 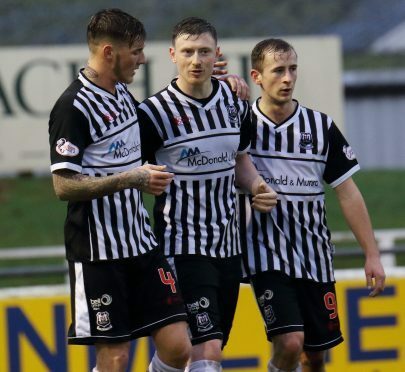 Elgin ended a five-match winless sequence with a late 2-1 triumph over Clyde last weekend, and Price hopes to carry that momentum into today’s game against the bottom-of-the-table Blue Brazil. Price added: “We are confident about playing anybody in home fixtures. We are on a reasonable run at home, having not lost since the Peterhead game on November 4. “I’m hoping we can pick up from where we left off but since Gary Bollan came in at Cowdenbeath they have definitely been harder to beat. Along with strikers Sutherland and Anderson, Elgin are without goalkeeper Iain Ross due to a groin injury, while defender Aaron Whitehead has returned to Lochee United on an emergency loan.